Throughout our project, we had to utilize various new technologies that many of us were not familiar with. A majority of our in-class planning time was spent writing scripts for our videos, and deciding what information was vital for using the site, and therefore warranted a video. We used the preexisting help page to guide us in deciding how to break up and designate the videos. We pulled from our knowledge of help pages we’ve used in the past, and came to the conclusion that one of the problems we’ve encountered with video help pages is that it’s difficult to pinpoint the instructions that directly address the individual problem. We considered a table of contents for our video but even that seemed too inefficient. We endeavored to create a more productive tutorial that could offer users instant and specific guidance. As a result, we decided to make a multitude of shorter and more direct videos, to establish that the help page is as user-friendly as possible. It was up to us to condense as much aid and instruction into a series of short tutorials. It was not a simple feat since the previous year’s group could compile their detailed instruction into a drawn-out text. Additionally, we searched for a way to put our own spin on it. Once we decided how to break up our videos, we scheduled a time to meet with the Digital Media Lab assistants. Our preliminary meeting was simple: we asked what kinds of tools we could access if we were to use the Digital Media Lab and how easy this technology would be to operate. We were introduced to Camtasia, a program that allows you to capture and record screen activity as you navigate. A microphone records your voice to provide simultaneous narration. In essence, Camtasia allows for the user to be “present” by being able to visually and audibly learn what the instructor is doing. We decided to use Camtasia to make our videos; we planned to create an account and record us chronicling the step-by-step. We booked a time to meet in the DML and recorded a video on our first visit. Aside from a few last minute script rewrites to ensure fluidity, everything was going according to plan. A funny note about a problem we had was when realized that the DML itself shares a wall with a bathroom in Milne, so there were some times where we had to wait to record to make sure no sounds of running water or hand dryers made their way into our video! We faced a few administrative troubles, including a time when the Milne staff could not find the key to the DML, but after some discussion and searching, our plans went off relatively without a hitch. There was also the instance when Dr. Schacht denied our example account entrance into the group forum after mistaking it as spam. Without access, one of our videos could not be produced. This mild setback halted progress for that video by a day or two, but we hold no grudges. Example123@gmail.com sounds like a pretty faceless email address. We would have done the same. We had to do a few retakes, but the reasons were nothing more than verbal stumbles; minor edits were accomplished through iMovie. iMovie was another technology we used, as stated before, mainly for smaller edits and some decorative polishing, such as the title slides. In retrospect, it is interesting to consider what Thoreau might have thought of our videos, and the Digital Thoreau website in general. Would he think that those who need the videos should not have access to the information, much like he thought that the Classics should not be read by those who did not understand the original language? Or would he be pleased to know that his work was being spread to a larger audience? 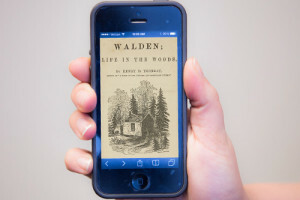 Thoreau’s revulsion towards innovation and technology is apparent throughout Walden, but his encouragement for advancement through learning is evident as well. In his conclusion Thoreau writes, “Things do not change; we change,” and we can justify our digital work with this maxim. As a future generation we have access to the technology and modernization of the 21st century, which we have employed in order to spread Thoreau’s teachings. Thus, a man who promoted learning and acknowledged change would deem our efforts worthy. Earlier this month I completed student observation hours at my old high school on Long Island. My work was simple—it included taking notes, passing out papers, and witnessing the disorder within an eleventh grade English class. For a portion of the school day, I could discuss Hamlet with a few uninterested groups, but that’s about the extent of the excitement. On my final day, I was rummaging through some papers on an English department desk, and I came across a project rubric that sparked my curiosity. The assignment was titled “Has Social Media Taken Over Our Lives?” After scanning the rubric, I gathered that the students would be tasked with examining their peers’ addiction to social media as well as forfeiting their cell phone for a week (I’m eager to see how that requirement went over). I don’t know which high school teacher organized the project, and I am afraid that I will never learn the students’ results, but the idea pushed me to do some investigating of my own. Over the weekend I conducted short, cross-generational interviews in order to access the control that communicative technology, specifically social media, texting and telephoning, wields over us. I asked my roommate, my mom, and my grandma a few questions pertaining to their usage/opinion of communicative technology and despite severe differences, all three individuals ultimately offered an identical conclusion. I began with my roommate, an eighteen-year-old female just like myself, in order to represent my own generation. Victoria confessed to spending roughly three hours a day texting, calling, emailing and skimming through social media. Her critique of the technology is that her cellphone/laptop battery dies too often, and that spellcheck/autocorrect fail to aid her writing. She cites many advantages such as convenience, the time-space compression, and the availability of information and exchange. She feels that she could last one day without her cellphone. She answers in the affirmative when I ended the interview with the question, has social media taken over our lives? When I asked whether or not she would change it if she could, she professes that we must learn to take the good with the bad. 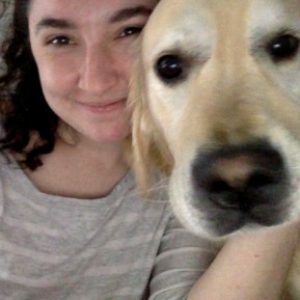 Following Victoria, I called my mom and offered her the same questions. My mom discloses to devoting thirty minutes a day utilizing communicative technology. She values the immediate access and the ability to hold multiple simultaneous conversations via texting. However, she hates the absurdity of it all. She uses words like “inane” and “insignificant” when describing how she witnesses a majority of people “walking around with their heads bent down checking things that are probably not that important.” My mom is adamant that social media has taken over our lives, and she states that she could last one week without her cell phone. Finally, I polled my seventy-nine-year-old grandma. Even though she does not use a cell phone or a computer, she spends thirty minutes a day on the telephone. She enjoys communicative technology in that it allows her to stay connected with friends and family. However, she dislikes how there is no “off-switch” on telephones, because she does not wish to be contacted after seven at night. She thinks that social media is given more attention than it deserves. When I inquired how long she could live without a cellphone she replied “indefinitely”, as she has never owned one. On the surface, the results are what anyone would expect. The teenage girl has her cellphone glued to her palm, gets a high off of Instagram likes, and is most bothered by the short battery life of her technological devices. The middle-aged woman judges younger people for their obsession with the devices, and utilizes technology for less social reasons. The elderly woman describes social media as, “Twitter and Facebook and the internet and all those other marvelous little acronyms”, and communicates strictly through telephone calls and hand-written letters. Nevertheless, all three subjects censure technology for its distortion of priorities and human social interaction. Victoria is willing to deal with the downfalls of a poor battery life, but she makes a point to mention how disconcerting it is to be surrounded by a group of friends, yet no one is looking or listening or speaking, because everyone is preoccupied with their own cell-phone, silently carrying on other conversations. She admits her own guilt, likening the checking of her screen to a sort of Tourette’s tic. My Facebook-less mom recounted a story of a coworker discussing a Facebook post about Kim Kardashian dyeing her hair, to which my mom thought, “who the f*ck cares?” Additionally, my mom mentioned an interesting qualm she had with the recent resignation of Zayn Malik from the band One Direction. 1D fans are calling in sick to work and reacting like this. Meanwhile, the death of her favorite singer, Jerry Garcia, and the consequent death of her favorite band caused no uproar, because it occurred pre-internet and couldn’t gain such overwhelming media coverage to amplify and prolong the event. My grandma expresses her concern with my generation’s inability to understand boundaries in social situations. Whether it is a friend, a superior, or a stranger, she believes that it is every individual’s responsibility to grant them undivided attention. Watching her grandchildren tap away in front of her, or learning of the amount of phone-use that occurs in classroom settings ultimately pains my grandma, not only because she deems it disrespectful, but because it interferes with true human communication. She views communicative technology as a means of escaping face-to-face contact, and that is a regressive characteristic of humanity. It is odd to find that such different people from different times can agree that we should shed the pretense of social media, disregard vapid pop culture, and devote more time and consideration to our physical present. Communicative technology is beneficial, far-reaching and impossible to supplant. Thus, it remains a personal choice whether to moderate your usage, or live at the mercy of electronic devices. While readers tend to focus on Thoreau’s physical removal from society, and his resulting forfeit of easily accessed food, warmth and shelter, I draw larger conclusions from his emotional and mental seclusion. From literature to everyday life, solitude and introspection prove to be cathartic. However, my observations have left me questioning whether or not privacy can have constructive or damaging affects. Last semester I took a course called the Woman Writer in which we worked with literature through a feminist lens. More so than any other piece, I long-awaited Ariel, a collection of poems by Sylvia Plath, since The Bell Jar has always been a favorite of mine. Anyway, I used to always hold Plath in high regard, because I recognized and respected her not only as a woman and a writer, but also as a victim. Plath was undeniably brilliant, but deeply mot ivated by an urge to please the men in her life: her controlling father, Otto, and her husband, Ted Hughes. As a result, many of her poems capture her resentment of gender roles. One of her poems in particular, ‘The Applicant’ depicts the story of an abrasive salesmen attempting to sell an appliance, a house-wife, to a young man. Sylvia Plath constructed ‘The Applicant’ days after deciding to divorce Ted Hughes, and her poem can be viewed as her disparaging commentary on marriage. In much of her work, Plath illustrates the hardship and inequity of being a woman, and refutes imposed ideals upon women. ‘The Applicant’ is no exception, as it draws upon and challenges a strict social expectation of coupling, and a subservient female role in marriage. Read along and listen here (her voice is eerily captivating). Although I commend Plath for her stance against gender conventions, the more I have studied Plath, and the more I read up on her, the less enamored I become. 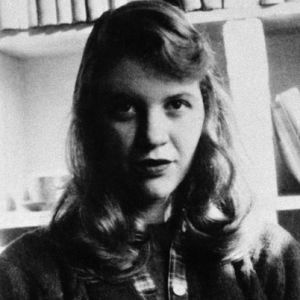 Given her powerful yet disturbing writing, the tumultuous relationships which she herself formed, and her horrific suicide, I am left questioning, which was more valuable to Plath, her art or her life? I have never thought to limit her work, or her life for that matter, to her mental illness. For this reason, I am left feeling disappointed with Sylvia Plath. I believe that her writing became so reliant on her pain and suffering, that she made no attempt at treatment. As a woman living in the 21st century, perhaps my critique of her is too harsh, but after reading a great deal of her work I can confirm that it does not extend beyond censure of the patriarchy and her struggles as a woman. Al Alvarez, an English poet, accurately viewed Plath’s self-destructiveness as “the very source of her creative energy. It was, precisely, a source of living energy, of her imaginative, creative power.” It is the nature of artists to incorporate their emotions and muses into their craft. But, Plath’s actual suffering and her work became one in the same. One of Plath’s idols, Virginia Woolf, coined the term “a room of one’s own” in which people of every gender are entitled to be alone, and uninhibited to focus upon themselves. In this state, Woolf believed that people could emerge stronger and more independent. I think that Plath found a room of her own, and locked herself inside of it forever. Thoreau resembles Plath in his commitment to solitude. He has literally created a roo m, a cabin, of his own in which he can dwell and learn to live deliberately, without contact from his superficial world. Like Plath, Thoreau seeks to gain vision, and to be able to share his experience with others. However, there is a great distinction to be made between the two. 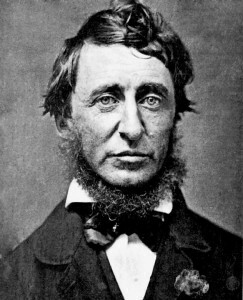 Thoreau removed himself from the world to pursue his passion, Transcendentalism. Plath isolated herself, detached herself from reality and ignored the well being of herself and her children. She became so obsessed with her work that she allowed herself to fall deeper into her pit of despair. It is a heart wrenching happening that Plath succumbed to her madness, while Thoreau led a liberating existence by combining his art with his life. In being driven by their burning passions, geniuses are rarely able to strike a balance between the two. Source: Plath, Sylvia. “The Applicant.” Ariel. New York: Harper-Perennial, 1999. Print.